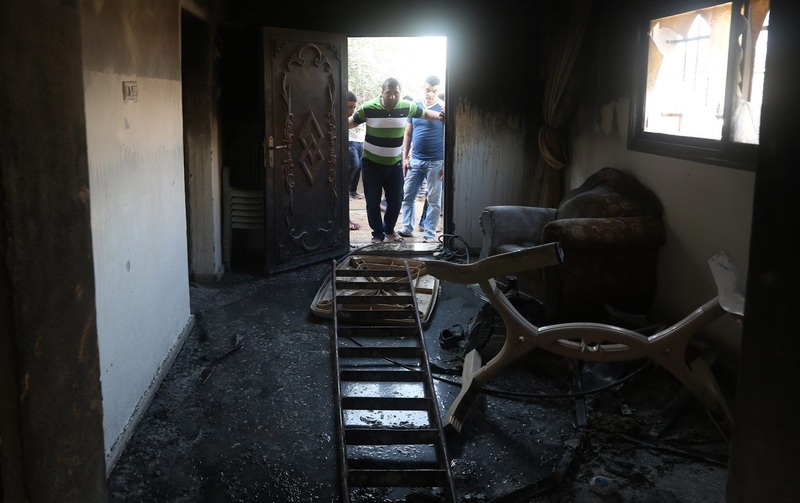 Today a settler attack on two Palestinian homes killed a Palestinian infant and severely injured his parents and siblings. 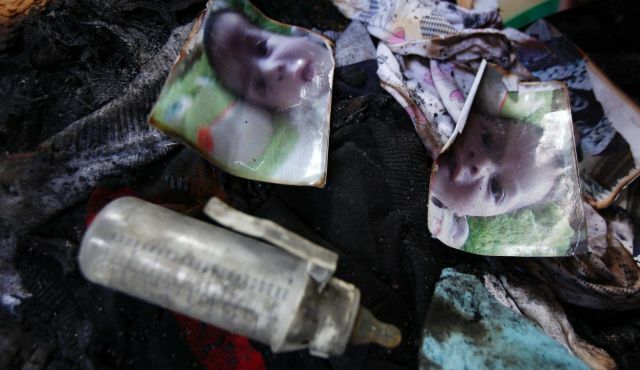 Palestinian infant burned to death in West Bank arson attack; IDF blames 'Jewish terror' This attack did not come out of thin air but was the consequence of an Occupation that treats Palestinians as little more than human animals. When you demolish Palestinian homes without a seconds thought, then you are dehumanising them. They don’t have ordinary needs for shelter, warmth and food. They are the untermenschen. 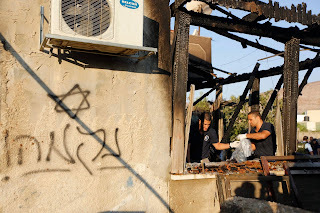 It is little wonder that settlers then absorb that message and decide to expedite the process and set fire to inhabited buildings. If there are deaths, so much the better, because then the Palestinians will get the message that they are not wanted. Netanyahu’s Cabinet contains the Party of the Settler Pogromists and Arsonists, HaBayit HaYehudi (Jewish Home). They have given consistent support to the repression of the Palestinians inhabitants of the Occupied Territories and are supporters of transfer, i.e. expulsion. To weep crocodile tears now over the death of a Palestinian infant after having whipped up racial hatred is the height of hypocrisy. But that is Zionism. When Palestinians are found to have killed Jewish settlers their houses are demolished, thousands of Palestinian homes are raided and they of course are locked up for decades and tortured. When or if the culprits of the latest tragedy are caught, their homes will be safe. After all how can you demolish houses in a settlement when you are committed to building new settlements? They will no doubt be subject to psychological analysis and found to be incapable of pleading or otherwise sick rather than criminal thugs. The settlement(s) where they lived will not be raided. In other words the treatment of settler killers is entirely different to that of the Palestinians. 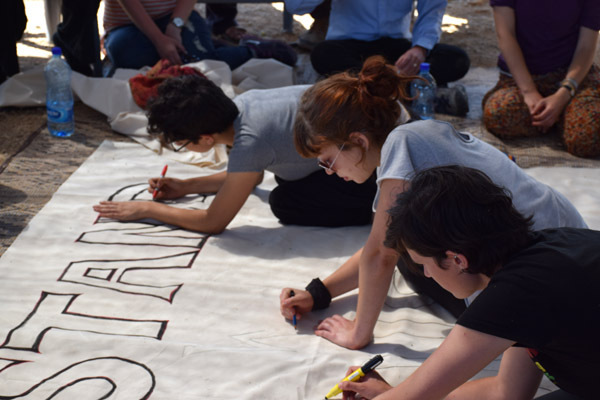 Over 70 Jews from around the world headed to Susya last weekend, where they stood with the residents of the West Bank village under threat of demolition against displacement and settler violence. It was part anti-occupation activism, part Jewish summer camp, part WWOOF and a little reminiscent of young foreigners coming to volunteer on a kibbutz. Over 70 Jews in their 20s and 30s, mostly from English-speaking countries, spent last Friday and Saturday in the impoverished Palestinian village of Khirbet Susya, whose residents are living under a looming threat of a second forced displacement from their homes. The first time was 30 years ago. It was my second time in the village that week. 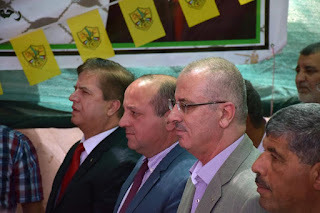 A few days earlier, I went to cover a solidarity visit by Palestinian Prime Minister Rami Hamdallah and the heads of mission of every single European Union member state. The tent erected by local Palestinian authorities to host their prime minister was still standing when I arrived in Susya on Saturday. This time instead of an assortment of body guards, PA systems and television crews, the large tent was full of sleeping bags and handful of activists painting banners. The youngsters came as part of a delegation from a group called All That’s Left. Two and a half years ago, I was among the 15 or so core founders of the group, whose self-defined common denominator was to be “unequivocally opposed to the occupation and committed to building the diaspora angle of resistance.” And although I soon dropped out, I have watched them closely since, curious and often proud of their creative, inspiring activism and seemingly bottomless reserves of energy and optimism. The trip to Susya had been in the works for months. The plan was to bring as many Jews — and others — somehow connected to overseas communities to the south Hebron Hills, where Palestinians live in a spattering of villages often composed of a few dozen tents without any connection to electricity or running water. Almost all of them are under constant threat of demolition by the Israeli army, and almost all of them are located within a few hundred meters of Israeli settlements that are illegal under international law but protected and provided for by Israel. All That’s Left was asked to come, invited by local residents who know the value of solidarity. 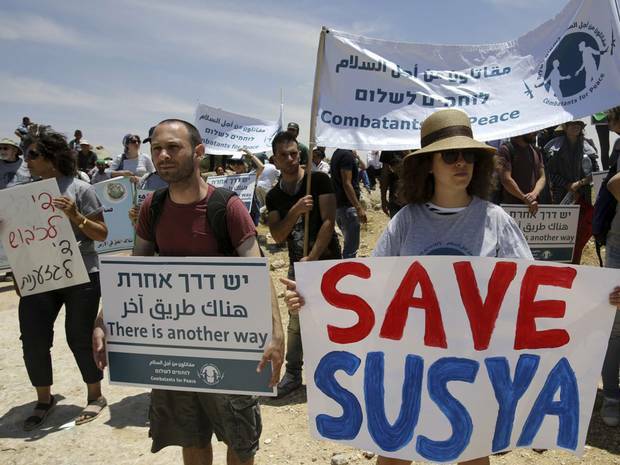 Susya has become one of the flagship cases of 21st century dispossession in the West Bank. Countless Palestinian, Israeli and international activists, diplomats, artists and many others have come to express their support in recent years. Villagers work closely with organizations like B’Tselem, Rabbis for Human Rights, Ta’ayush and Breaking the Silence. 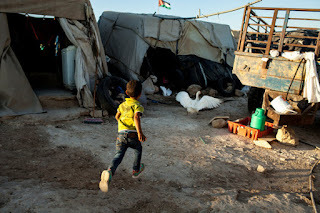 At the official event earlier in the week, the United Nation’s humanitarian coordinator for the West Bank optimistically noted that public campaigns and international efforts have succeeded in preventing planned displacements in the past. Maybe it could work here, too. But the primary aim of the two-day visit by the young, mostly American and British Jews, was to make an immediate, tangible and positive impact on the lives of the Palestinian residents of Susya and two neighboring villages, Bir el-Eid and Umm al-Khair. For weeks beforehand they held fundraisers and launched a Kickstarter-type online campaign in order to buy building materials, work tools and plants. The villagers wanted help with two things: repairing their derelict, dirt access roads, and planting new fields of za’atar, a variant of thyme common throughout the Levant. Early Friday morning, 50 or so All That’s Left members set out from Jerusalem, hoping to get in a few solid work hours before the sun made it impossible to break through the packed earth and move an endless supply of rocks. That night, they slept in the tent erected for the diplomats and Palestinian prime minister. By the time I arrived Saturday morning, in a bus with two dozen activists and a few +972 bloggers, the volunteers had already left for their day of road flattening in a nearby village. After a short briefing on the problems Susya is facing and the type of work they need help with, we were brought to a small za’atar field with no more than a dozen rows and instructed about which weeds and rocks needed to go and which were “good for the za’atar.” Gardening tools and buckets in hand, the activists got right to work. The atmosphere was energetic — reminiscent of something between a Habitat for Humanity project and foreign Zionist volunteers in the 1950s coming to help “reclaim the land,” albeit this time for Palestinians. 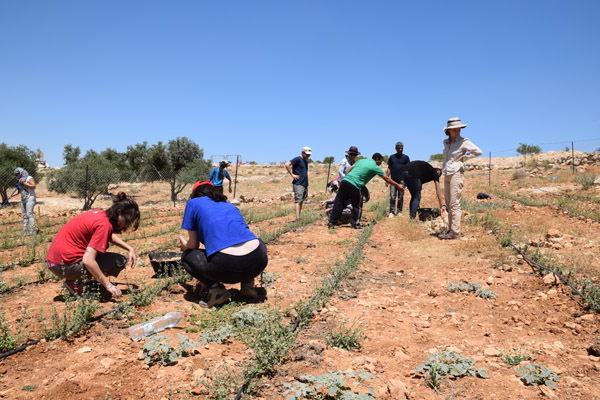 After a couple of hours, though, the sun was bearing down and all but a couple of the volunteers — who were determined to get every last weed — decided that their work was done, sardining themselves into the comically scant shade of a few freshly planted olive trees. A few hours later, the chain-gang contingent returned for lunch and everyone squeezed back into the prime ministerial tent, adorned with left-over Fatah flags and banners of current and former PLO chairmen Abbas and Arafat. As people finished their lunch of bread, vegetables, tahini and — not quite vegan — tuna, the men who had been accompanying us most of the day noticed young settlers coming down the hill from the adjacent settlement that long ago took over not only Susya’s land, but also its name. Aside from the press event with the politicians and diplomats earlier in the week, all of my previous experience visiting the south Hebron Hills has been while reporting on the work of Ta’ayush, a group that, pretty much on a weekly basis, puts its bodies in between aggressive, violent settlers and Palestinian herders and farmers. The south Hebron Hills is notorious, along with the hill country south of Nablus, as an epicenter of settler violence — the Wild West. This is a place where the Israeli army escorts Palestinian children on their way to school, to protect them from settlers. It is an area where videos of settler violence long ago stopped being a newsworthy phenomenon. And here they came. The All That’s Left group had received briefings on how to react in case this type of thing happened. Non-violence was key, and nobody really wanted to get arrested — a regular occurrence when left-wing Israeli activists stand between Palestinians, settlers and the often clueless soldiers dispatched to whichever remote, arid valley in which the settlers have decided to make their presence felt that day. The activists there on Saturday ran, or walked quickly toward the interlopers — but everybody stopped short after 100 meters or so when it became clear that they weren’t actually coming to make trouble. Back to tea, and a little bit of group learning. An hour later, however, different settlers were spotted on another hill a couple of small valleys over — this time approaching a patch of olive trees owned by residents of Palestinian Susya. A handful of the Palestinian men and a dozen children start running in their direction. I grab my camera and another dozen of the activists and I follow suit. By the time we arrive the settlers are gone and Nasser, the group’s point man in the village, is talking, distraught and out of breath, to three soldiers who have just arrived. It seems that a few settlers had come down from the direction of the settlement of Susya and started snapping off branches from the relatively young olive trees. When Nasser approached, they started throwing stones. A lone female soldier who was positioned at a watchtower seemingly in the middle of nowhere and yet smack in the middle of all the action, had tried to tell Nasser to leave. Maybe she told the settlers to leave, too. Either way, nobody really cared. She had to duck to avoid being hit by the stones being thrown by the settlers. Nasser got the whole thing on video. A few minutes later, a civilian police officer and an officer from the Civil Administration, a nice term for a Military Government, arrived. 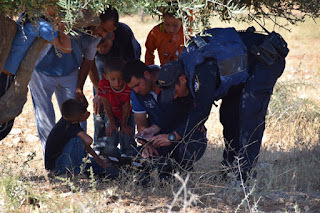 The police officer looks at the broken olive branches and remarks, “the settlers wouldn’t cut down trees — it’s Shabbat.” But he seems far more interested in the video of the stone throwing. With his cell phone, the cop films the video, interviews the female soldier who witnessed the whole thing, and promises to look for the culprits. Nobody really takes them seriously. According to research by Israeli human rights organization Yesh Din, only 7.4 percent of Israeli police investigations into settler violence and vandalism against Palestinians result in indictments. More often than not, the official reason cited for closing the investigations is “perpetrator unknown.” In other words, for whatever reason, the police cannot locate a suspect — often times in spite of video evidence and eyewitnesses. The police left. The army left. Nasser promised to go to the police station later to file an official complaint and hand over a copy of the video. We all headed back across the two cracked valleys toward the tent. It was getting late and the bus was coming soon to take us back to Jerusalem. The organizers of the All That’s Left group started their debrief session, asking participants to talk about their experiences, discussing strategies for moving forward and logistics for the trip home. At some point I decide to wander toward the main road in order to take some photos, when an army jeep approaches. An officer gets out. A captain. He yells to me, “hey, kiddo! Come over here.” I walk over, not quite knowing what to expect. “Call over Nasser,” he tells me. “We caught the guys who were throwing stones and I want to see his video to make sure it’s them.” A little stunned, I point him in the right direction. The lieutenant doesn’t want to walk into the village. Maybe it’s all the activists, maybe he’s lazy, maybe he doesn’t feel safe. Who knows. Another Palestinian man approaches and, after getting the same explanation, starts yelling for Nasser. Nasser brings over his laptop. In an almost identical scene as before, they crouch below an olive tree to mitigate the harsh glare and watch the video. It’s them, the officer says, adding, “they’re not from here. The people in [the settlement of] Susya don’t want trouble either, you know.” “Sure,” Nasser says with a shrug, promising to bring the video to the police station the next day. And so it ends. There’s no way of knowing if it would have ended differently had dozens of international and — Jewish — Israeli activists been there that day. It’s clearly an anomaly, but maybe the soldiers and police took their job more seriously that day? Maybe they just got lucky? Maybe the suspects won’t even be charged. It doesn’t really matter. 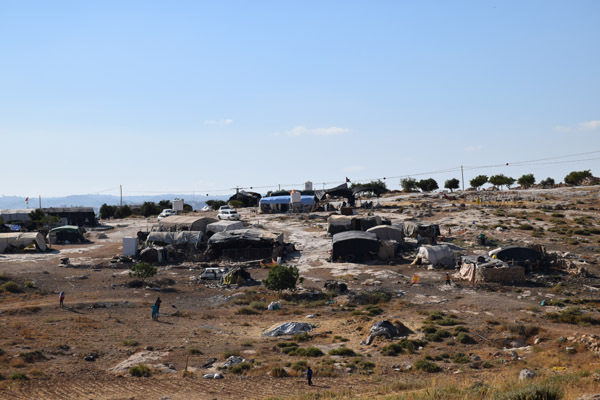 Susya is still facing imminent demolition, its residents in danger of forced displacement. The army wants to move them into Palestinian-controlled cities, out of Area C, the part of the West Bank Israel retains complete control over, and which many in Israel’s government hope to one day annex. The story of Susya is not extraordinary. The same thing is happening — without dozens of Jewish solidarity activists — in other communities in the south Hebron Hills, in the E1 area near Jerusalem, in the Jordan Valley and even inside the Green Line in villages like Al Araqib. In all of those places, the Israeli army is trying to move Palestinians out in order to move more Jews in, or at least to give them control over more land. Susya is not extraordinary, it is probably not the village that will get the world’s attention. Susya is one story of the occupation. And the solidarity visits, by diplomats, foreign college students or Palestinian and Israeli activists, is one story of resistance. The rendezvous was scheduled for 11:30 am, outside the Arlozorov Street Railway Station in Tel Aviv. I arrived at 11:35. "Three buses have already been filled, but don’t worry – the fourth bus will soon arrive" said the organizers’ representative. 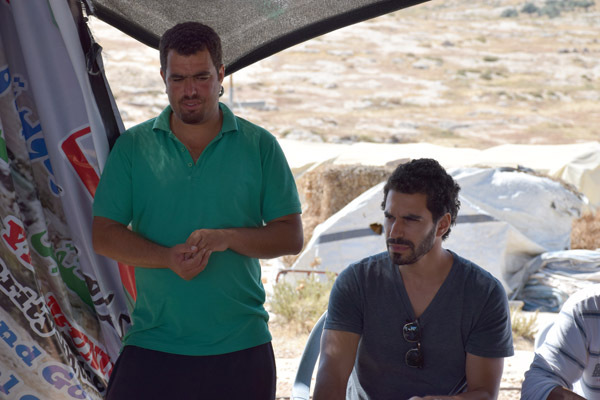 "There will be a place for anyone who wants to go to the protest in Susiya." It is long since there was such a wide response to a call for a demonstration in the wild West Bank. Among the passengers could be seen quite a few long-time activists who had however not been seen in recent years. Why did the case of Susiya evoke so much attention, in Israel and throughout the world? (Circulating on the bus was the current New York Times op-ed page, featuring a moving personal story of a Susiya resident). This tiny threatened village is in every way worthy of support and solidarity - but in the past, quite a few instances of no less outrageous injustice have been perpetrated and met a virtually complete indifference and silence. One can never know in advance which particular case will become the focus and symbol of a struggle. Little more than an hour's drive separates the vast metropolitan Tel Aviv from the godforsaken hamlet of Susiya in the middle of the desert. First the travel is along congested intercity highways – then, through back roads which become ever more narrow and in bad repair, the further one continues to the east and south. Somewhere, without noticing, the Green Line is crossed into the territory where there is not even a semblance of democracy, where the landscape is predominantly brown rather than green - apart from the occasional green patch of a settlement, which had the privilege of being connected to the Israeli water system. At the end of the trip, the narrow road forks, and the sign to the right side says "Susiya" - but nevertheless, we turned to the left. The sign erected by the military authorities refers to the other Susiya – the Israeli settlement Susiya, which claims to be the continuation of a Jewish village of the same name which existed on this location during the Roman and Byzantine period. "Come and see Susiya - an ancient Jewish town" says the sign on the road we had not taken. The Jews who lived here 1,500 years ago had lived in caves. In the Twentieth Century, Palestinians had been living in these same caves, until in 1986 the army came to expel them and turn the caves into an archeological site managed by the settlers. The Palestinians had to move to miserable shacks erected on what was left of their land. Is it possible that they actually were the descendants of those who resided in those caves in the Fifth Century? At the beginning of the Zionist Movement David Ben Gurion brought up that at least some of the Arabs in this country are descendants of Jews who lived here in the past, and who at some time were converted to Islam and started speaking Arabic. In 1918 Ben Gurion even published an entire book on this subject, in cooperation with the future President of Israel Yitzhak Ben-Zvi, including detailed historical documentation to support this theory. But before long it became clear that, even if some of the Palestinians’ ancestors had been Jewish, at present they have no interest whatsoever in being Jewish or promoting the Zionist Project. So, Ben-Gurion and his colleagues lost interest in further promoting this issue. In the direction of Palestinian Susiya there was no road sign. 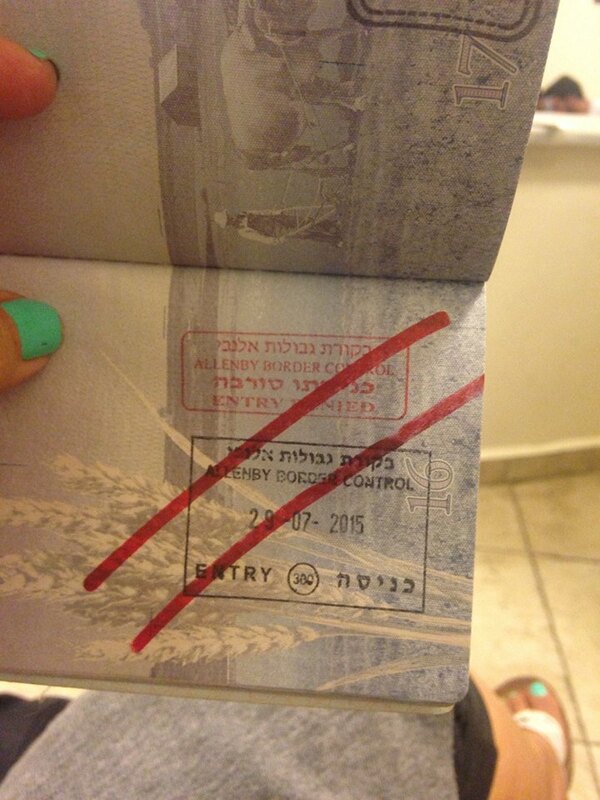 For the Israeli authorities, it simply does not exist. 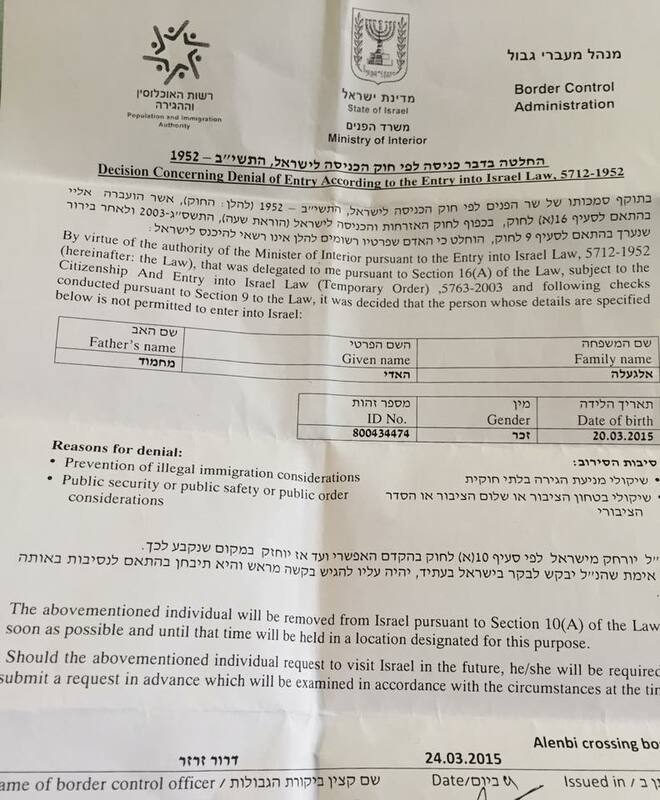 "The competent military authorities take the position that there had never existed an Arab village named Susiya" stated on the Knesset floor Deputy Defense Minister Eli Ben-Dahan, of the Jewish Home Party. "Palestinian structures were built without permits on that location, and were demolished during the 1995-2001 period. Illegal construction continued, against which demolition orders were issued. In May 2015 the Supreme Court rejected a petition by the Palestinians for an interim injunction against the demolition of these structures." There are no road signs, but it is not difficult to find Palestinian Susiya, with the Palestinian flag painted on rocks along the road. Four buses arrived from Tel Aviv and three from Jerusalem, plus quite a few private cars, and a minor traffic jam was created in the middle of the desert. "Pay attention, it is now the hottest hour of the day, it's one of the hottest places in the country, and there is almost no shade" warns the young woman in charge of my bus. "Please be sure, all of you, to cover your heads and take water with you. For those who have not brought it with them, we provide bottled water". On a low ridge above the bus could already be seen a human stream winding its way towards the rally. The concrete cover of a rainwater collection cistern has become a makeshift podium, with several loudspeakers and a Palestinian flag flying. When the group from our bus arrived, the speeches were already under way, in a mixture of Arabic, English and Hebrew. "67 years after the Palestinian Nakba, it is still going on! They want to expel the residents of Susiya from their land! Are we going to let them do it?" cried former Palestinian Minister Mustafa Barghouti, eliciting a loud chorus of "No! No!". "After the Apartheid regime in South Africa fell, Nelson Mandela said that the fight is not over, the next part is the Palestinian struggle. We are here, we are struggling. We will go on struggling until Palestine is free!" (Chanting in Arabic and English "Free Palestine! Free Palestine! Free, free Palestine! " Susiya resident Nasser Nawaj'ah, a leader activist of the struggle, spoke in Hebrew to those who came from Tel Aviv and Jerusalem: "Welcome to Susiya, all of you, welcome to Susiya, the fighting Susiya which will not give in! Our struggle is already going on for decades. In 1982, they erected the settlement of Susiya on our land. In 1986, they expelled us from the caves and turned them into an archaeological site of the settlers, then we moved to the farmland, all what was left to us. In 2001, they destroyed everything and drove us away, but we came back and set up our village again. You are most welcome here, we are grateful for the solidarity and support of all those who have come here. You are the other face of Israel, the face which is different from what we see of the soldiers and settlers who come to us every day. You give us hope, the hope that we can still live together, Palestinians as Israel's neighbors in peace." He was followed by Professor Yigal Bronner, who teaches history of India at the Hebrew University of Jerusalem and is a prominent activist of the Ta'ayush Movement, which is active already for many years in support of the residents of the South Hebron Hills. "We are here in Susiya. What is Susiya? Not much. Some cisterns which the army had not filled with dirt, a few sheep which the settlers have not yet stolen, some olive trees that have not yet been cut down. 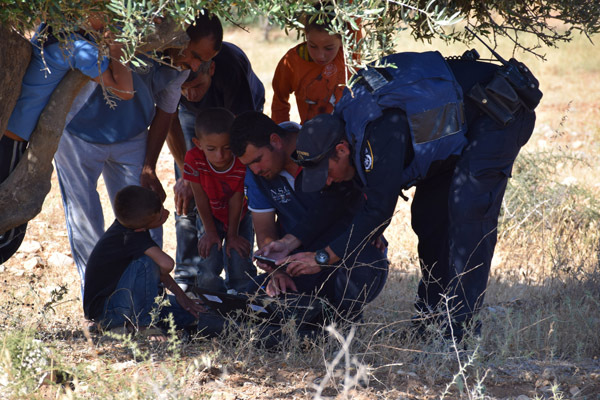 What is Susiya? Susiya is 350 people who hold on to the land, clinging and clinging and holding on and not giving up, because it's their home. Quite simply, this is their home. Opposite us is the other Susiya. The Susiya which is armed and surrounded by a fence, which is connected to to water and electricity and sewage and has representatives in all the corridors of power, and it wants to grab what little is left of this Susiya where we stand. Susiya against Susiya, this is the whole story. The Palestinian Susiya has no soldiers and no police and no representatives in the Knesset and in fact it does not have the vote. But it has us. We are here to stand with Susiya and we will not leave. We will do everything we can to be here and prevent the destruction. And if does take place, we will be here the next morning to rebuild, together with the residents. Susiya is not alone! "(Chanting of "Susiya, Sussiya do not despair, we will end the occupation yet!" in Hebrew and "Yaskut al Ikhitlal", "Down with the Occupation" in Arabic. "It is very important that you all came here, it is important to continue the struggle. There will be here another demonstration next Saturday, and on August 3 at 9:00 am there will be the hearing on the appeal of Susiya at the Supreme Court. It is very important to be there! Susiya is not alone! 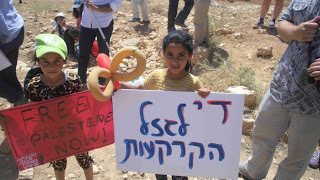 Susiya is not alone!" After the speeches - the march to the edge of the ridge. "For anyone who feels badly affected by the heat and sun, there is a tent with shade and plenty of water. Don’t get hurt unnecessarily. And now – forward!" 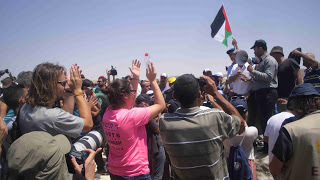 Together with the Palestinians, locals and those who especially came, we all moved ahead to the rhythmic beating of the "Drummers Against the Occupation", and the heat did not seem to reduce their energy and enthusiasm. Above the crowd　were waving　the placards　of "Combatants for Peace",　one of　the demonstration's organizers,　with the caption　"There is Another Way" in Hebrew,　Arabic　and English. "Though shalt not rob thy fellow" read the big sign carried by Rabbi Arik　Asherman, who already for many years did not miss any demonstration, "Rabbis　for Human Rights" being another of　the protest initiators. Other Biblical slogans: "Have we become the like of Sodom, did we assume the face of Gomorrah? ", "Save the poor his robber, protect the miserable from the heartless despoiler" "Zion shall be built on Justice", "Each shall sit in content under his vine and his fig tree." A five years old Palestinian girl held upside down a large sign in Hebrew reading "No more land grab!". One of the Israelis drew the attention of a woman in traditional Palestinian dress, apparently the grandmother. The granddaughter, laughing, turned the sign in correct direction before the press photographers arrived at this part of the march parade. Near was walking a strapping young man wearing a T-shirt of the FC St. Pauli soccer club of Hamburg, Germany, whose fans are known for their fight against racism, and next was a woman whose shirt proclaimed "Stop the Pinkwashing! ", protesting the cynical use made of LGBT people by the government international PR apparatus ("Hasbara"). The text on the bag of a veteran Jerusalem activist referred to the elctions earlier this year: "We did not succeed in throwing Netanyahu out, which is very harsh and painful, but at least let him keep his paws off Susiya!" 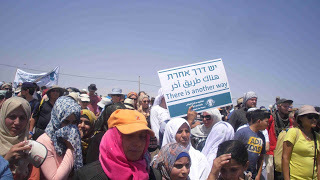 At the end of the march, dozens lifted with great effort a 30-metre long sign reading: "Susiya is Palestinian, and Palestinian it will remain!". When the buses on the way back passed the official sign about "The ancient Jewish town" we could see it at the top of the ridge above the road. SUSIYA, West Bank — IN 1948, as Israeli forces closed in on his village of Qaryatayn, my grandfather carried my father in his arms to Susiya, about five miles north, in the South Hebron Hills area. “We will go back home soon,” my grandfather told my father. They did not. Qaryatayn was destroyed, along with about 400 other Palestinian villages that were razed between 1948 and the mid-1950s. My family rebuilt their lives in Susiya, across the 1949 armistice line in the West Bank. In 1986, my family was expelled from our home once again — not because of war, but because the occupying Israeli authorities decided to create an archaeological and tourist site around the remains of an ancient synagogue in Susiya. (A structure next to the abandoned temple was used as a mosque from about the 10th century.) This time, it was my father who took me in his arms as the soldiers drew near. “We will return soon,” he said. If, in the coming weeks, the Israeli government carries out demolition orders served on some 340 residents of Susiya, I will be forced to take my children in my arms as our home is destroyed and the village razed once again. I do not know if I will have the heart to tell them that we will soon go home; history has taught me that it may be a very long time until we are able to return. In 2012, the Civil Administration branch of Israel’s Defence Ministry issued demolition orders against more than 50 structures in Susiya, including living quarters, a clinic, shop and solar panels. The reason given in these orders was that our village was built without permits from the Israeli military authorities. The new Susiya was built on Palestinian villagers’ private agricultural land, but that is no safeguard. In practice, it is virtually impossible for a Palestinian living in what is known as Area C — the 60 percent of the West Bank under both civil and security control of the Israeli military — to receive a building permit. According to Bimkom, an Israeli nonprofit focused on planning rights, more than 98 percent of Palestinian requests for building permits in Area C from 2010 to 2014 were rejected. The threat has now become immediate. Following the initial distribution of demolition orders, there was a political and legal campaign spearheaded by the residents of Susiya that had support from Palestinian, Israeli and international activists and rights groups. The village was not demolished, our case returned to the courts and the pressure let up. But this past May, a few months after the re-election of Prime Minister Benjamin Netanyahu, the Israeli Supreme Court justice Noam Sohlberg, who himself lives in an Israeli settlement that is considered illegal under international law, caved in to pressure from right-wing and settler organizations and ruled in the High Court that the Israeli military could go ahead with demolitions in the village — despite the fact that the higher-ranking Supreme Court had scheduled a hearing for our case on Aug. 3. Earlier this month, I learned from lawyers working against the demolition of Susiya that representatives of the Israeli military had stated their intent to demolish parts of our village before the Aug. 3 hearing. Since the May ruling, we in Susiya have been grateful for an outpouring of support and solidarity. Last week, the State Department’s spokesman, John Kirby, made a strong statement on the issue. That was a step in the right direction, but we need more than mere declarations now. If the Israeli government demolishes all or part of Susiya once again, it will be for no other reason than that we are Palestinians who refused to leave, despite immense pressure and great hardships of daily life under occupation. The situation in Susiya is only one of many such situations in Area C of the West Bank. Several villages near ours have pending demolition orders as well. 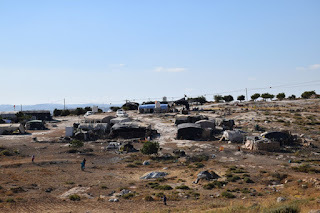 If Susiya is destroyed and its residents expelled, it will serve as a precedent for further demolitions and expulsions through the South Hebron Hills and Area C of the West Bank. This must not be allowed to happen. This story is not a story of Jews against Muslims, or even a story of Israelis against Palestinians. We’re grateful for the many messages of support our village has received from Jewish communities around the world, and the groups and activists working by our side include many Israelis. This is simply a story of justice and equality against dispossession and oppression. Nasser Nawaja is a community organizer and a field researcher for the Israeli human rights organization B’Tselem. Her: Why are you here? Me: visiting family, friends and opening ceremonies for playgrounds. Her: where is your family? Her: what is the relation? Her: (clearly agitated with me) no aunts uncles? Her: where are you staying in Jerusalem? Her: what is his name? Me: you want the names of all my cousins? Me: there's hundreds of them. It's a big family. I don't get what you're asking. Her:(slams her hand down on desk) who are you staying with? Me: My cousin Adel, whose name and number I just gave you, along with every other official who asked. Her: (now very angry) I am asking the questions. Her: (slams hand again on table) who else lives with your cousin? Her: Why you not answer the questions? Me: I can't read your mind and I don't care what you like. I'm answering your questions. Her: you don't care? Ok. Get out. I will show you. She then calls Stephanie in and asks her a bunch of questions about me. An hour later she and another called me over to tell me that I'm denied entry for non cooperation. I actually lost it. I screamed at them both. They threatened. I assure them I wasn't afraid. Strangely I actually wasn't. I ordinarily would be. I made a scene. A big one. I could hardly believe the insane feeling I had. They brought out three soldiers who just stood and stared at me. I kept yelling. I told them they're the ones who should go back. I said it was bad enough we have to enter like tourists and endure their endless humiliations and power plays. Everything inside of me was shaking, but I don't think it made its way outwardly. I don't know what I looked like to others. Crazy? insane? brave? Desperate? I did realize at some point that they had no idea what to do with me. That they had expected me to just go quietly, but I was very loud instead. The truth is that I just wanted to cry. A desperate simething from my gut. They give us so much to cry over. All the time. So I just screamed at them. Thieves, occupiers I called them. You wish you had the same roots as I do, I screamed. You should be the one to leave, not me. I'm a daughter of this land. Then they took me to my luggage and sent me in the bus. I regret walking and not making them carry me. @USConsulJO US Embassy in Amman would not even let me in the door. Nor would they even take my name or allow me to lodge a complaint at reception. At a minimum these representatives of the US State Dept should be compiling statistics on the systematic humiliations and denial of entry to US citizens. Israel is the biggest recipient of US handouts in the world. 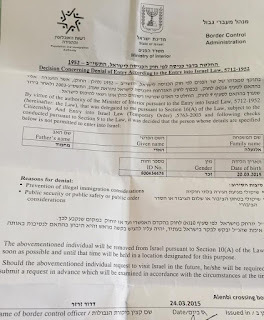 I was told told that another person in front of me "a real American" according to the receptionist, who was denied entry at the Jisr, and as far as I can tell, they didn't take his information either. If any of you are inclined, please write/call or tweet to the embassy. Western Saharan singer and actress Aziza Brahim has stated that she no longer plans to perform at the Jerusalem Sacred Music Festival in September. The release went on to say that campaigners had pointed out the parallels between Morocco’s illegal occupation of Western Sahara and Israel’s abuses of Palestinian rights. 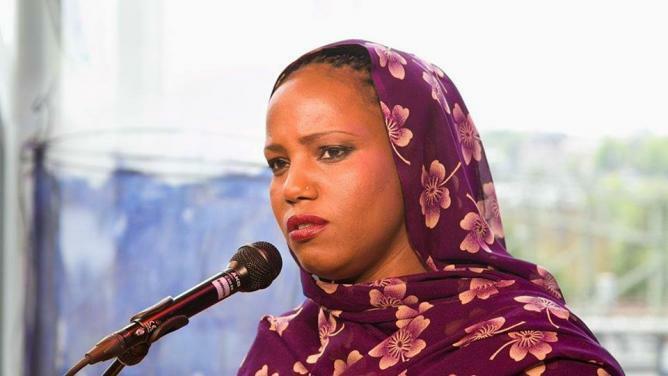 Aziza Brahim was born in the Sahrawi refugee camps which were established following the Moroccan occupation of Western Sahara in 1975. 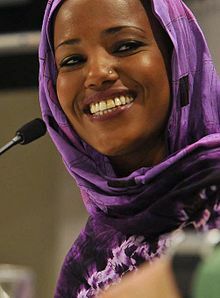 Partly educated in Cuba, she won a Sahrawi national music competition in 1995 and launched a singing and acting career. 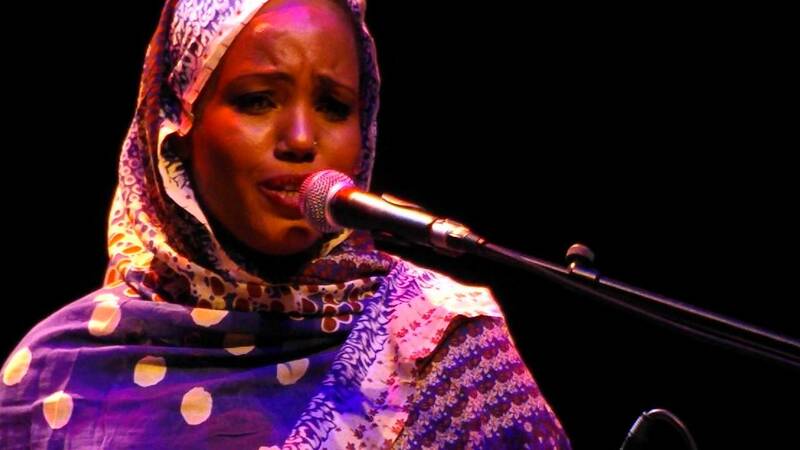 Some of her songs are based on poems by her grandmother, al-Khadra bint Mabruk, known as the “poet of the rifles” in the Sahrawi national movement. Western Sahara has been called “Africa’s last colony.” Divided between Morocco and Mauritania when Spain withdrew in the 1970s, against the wishes of the Sahrawi people’s anti-colonial movement, thousands of Sahrawi people have lived in refugee camps in Algeria for four decades. The two sections of Western Sahara are split by the world’s second-longest wall – a fate which is familiar to Palestinians. As with Palestine, the international community has failed to act on the issue of Western Sahara, with a referendum plan announced in 1991 never implemented. 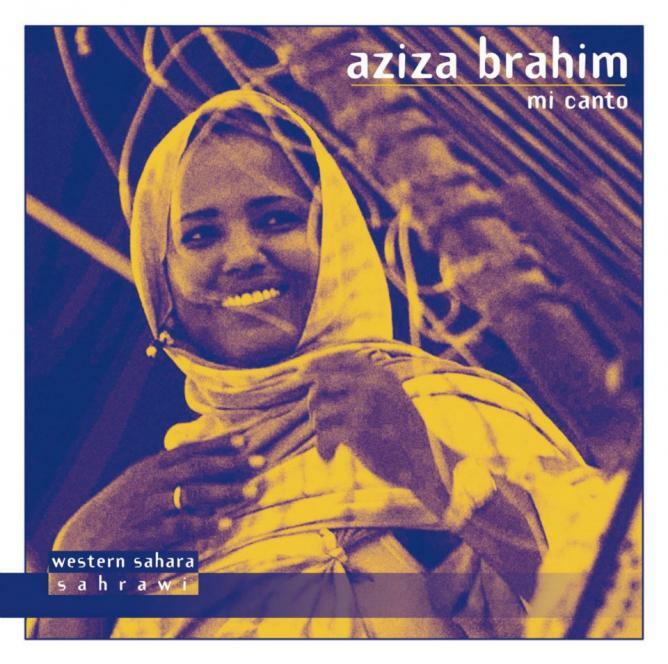 The life and music of singer Aziza Brahim is irrevocably bound to her heritage as a Saharawi native of Western Sahara, a small country sandwiched between Morocco and Mauritania. Born into a refugee camp, Brahim learned how to sing from her revolutionary grandmother, and grew up to make music that speaks out against the oppression of her homeland. We take a closer look at Western Sahara’s voice of resistance. Due to its lack of self-governance, Western Sahara is considered to be the last African colony. Although the country was originally controlled by Spain, when the Spanish ended their colonisation of the territory in 1975, Morocco made the decision to take over the area. After the Moroccan invasion, half of the Saharawi population remained in Western Sahara, while the other half was forced to flee to southwest Algeria, where one of the largest refugee camps in the world was established. Brahim was born in the refugee camps in 1976. She never met her father, who remained behind in Western Sahara when the rest of her family fled to Algeria. While living in the refugee camps, she was exposed to the extreme conditions of living with 200,000 other Saharawi who all depended on international aid as a main source of survival, and where temperatures can reach 130 degrees Fahrenheit. In 1993, a ceasefire was enacted when the Polisario Front, the Saharawi liberation movement for Western Saharan independence, and Morocco agreed to end the war and hold a referendum. This would allow the Saharawi to have a chance to vote for self-governance or integration with Morocco. However, 20 years after the ceasefire, and 40 years after the start of the war, the referendum still has not taken place. While growing up, Brahim was greatly influenced by the many musicians in her family including her grandmother, Al-Kadra. Known as the ‘poet with the gun,’ her grandmother was one of the most influential female poets in the camps and has been referred to as the symbol of freedom and resistance. Brahim was encouraged by her family to compose poetry for her grandmother and later perform with her. 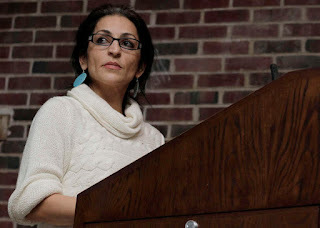 At age 11, in 1987, Brahim received a scholarship to study in Cuba, but in 1995, she went back to the camps after she was no longer allowed to study music due to her scholarship requirements. After going back to the camps, Brahim’s music career began to take off. She won first place at the annual National Culture Festival, a music festival organised by the Saharawi Minister of Culture in the camps. After winning, Brahim joined the National Saharawi Music Group, a group dedicated to representing Saharawi music through tours around Algeria and Mauritania. 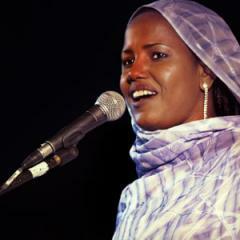 In the same year as her collaboration with the Saharawi Minister of Culture, two of her songs became hits when they were released by the Spanish label Nubenegra as a part of the album A Pesar de las Heridas, a record intended to celebrate Saharawi music by releasing songs by various Saharawi artists. 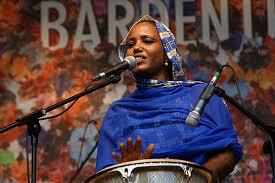 Her talent was then discovered in 1998 by the popular Saharawi group, Leyoad, who invited her to join them. This allowed her to travel to Spain, France and Germany on their European tour. 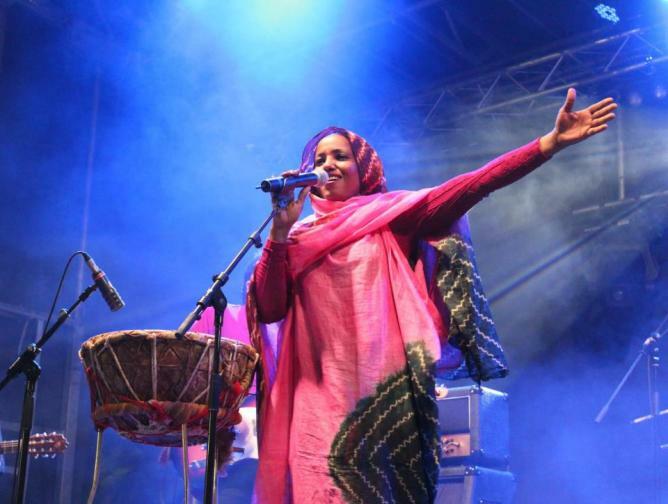 Upon her return from Leyoad’s European tour, she began to record music with various Tuareg musicians for the Saharawi National Radio. Thousands heard her music and she began her rise to fame soon afterward. In order to further the growth of her music career, she moved to Spain, where she began to compose her own songs and tour around the country. In 2007, she began her first international collaboration with the Spanish-Latin jazz band Yayabo. 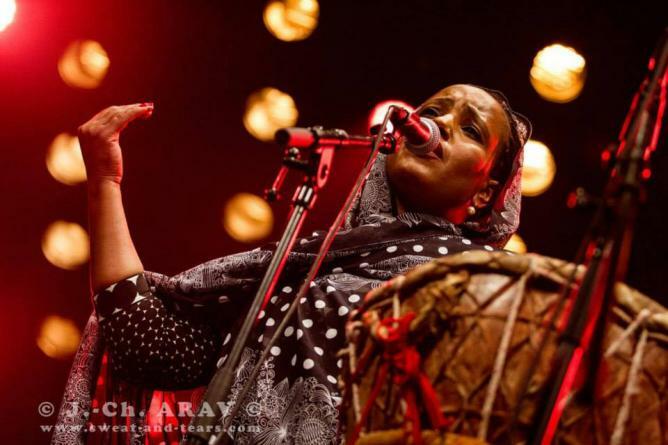 A year later, she founded the group Gulili Mankoo, which brought together singers and composers from Western Sahara, Colombia and Senegal. During her time with the group, Brahim’s own style shifted to a focus on blues and rock. With the collaboration of Gulili Mankoo, Brahim released her first album, Mi Canto. The album was produced by Brahim, but it was released worldwide by the French label Reaktion and was soon ranked number one in the World Music list. 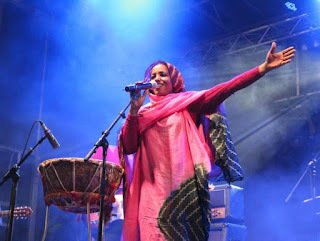 Some tracks, like the title, are in Spanish, while the other songs are sung in a mix of Spanish and Hassaniya, an Arabic dialect that traces back to Yemen and is spoken mainly in Western Sahara and Mauritania. In 2009, Brahim’s international collaborations continued to expand. She recorded the song Interrapcion - Crisol 09 with the Basque rap group Oreka Tx and joined their tours around Spain and France. In the same year, Brahim was also featured in Listen To The Banned, an album dedicated to censored international music, especially from the Middle East and Asia. In addition to her music, Brahim began her acting career in 2011, in the movie Wilaya, also known as The Tears of the Sand, by the Spanish director Pedro Pérez Rosado. The film tells a story of a Saharawi family trying to cope with the sudden death of their mother, as well as the visit of their little sister who has been living most of her life in Spain. The film accurately portrays the situation of many Saharawi families who have members who leave to study abroad for many years. Brahim not only acted in the film, but also produced its soundtrack. Wilaya received two awards at the Abu Dhabi Film Festival and Malaga Film Festival, including the award for Best Original Soundtrack. Brahim was also given the Freedom to Create Prize, an award given those who use the arts to fight oppression and advocate for the common good of societies. In 2012, Brahim released her second album Mabruk, which translates to congratulations in Arabic. The album was released to honor her grandmother and congratulate her on all of her accomplishments. 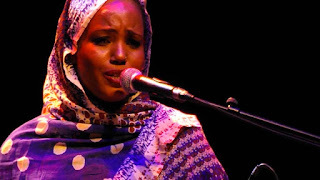 The album featured the collaboration of the popular Saharawi poet Bahia Mahmud Awah. The Dutch Magazine Heaven listed Mabruk as the album of the year. The success of the album landed Brahim a performance in the well-known international festival World of Music, Arts and Dance (WOMAD). The song Julud mentions her mother and honours all the sacrifices her mother has made for her. In this song, she used the tabal as the main instrument in addition to modern instruments. The tabal is a traditional Saharawi instrument played only by women. Throughout the nine-track album, Brahim continues to mix Hassaniya and Spanish in her music. 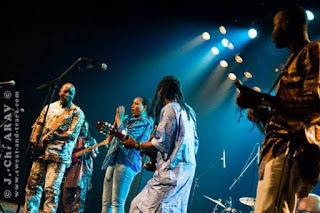 For Soutak, Brahim collaborated with the Spanish musicians Guillem Aguilar and Nico Roca, as well as the African musicians Kalilou Sangare and Badra Abdallahe. Throughout the album, Brahim mixes Arabian, Andalusian, African and Latin sounds, which had great influence on her while she lived in each location. The album, produced by Chris Eckman and released by the Glitterbeat Records, was ranked number one no less than twice in the World Music Charts Europe (WMCE). The success of Soutak landed her an appearance on the TV shows Later with Jools Holland in the UK and Vrije Geluiden in Amsterdam, along with interviews with dozens of international magazines and blogs. Brahim feels a sense of responsibility to give an identity to those who face the hardships of the refugee camps and the lack of a peaceful solution to the long-standing conflict between Western Sahara and Morocco. With the combination of the oral tradition of Saharawi culture and the trend of the newer generation going abroad to study, there is a tendency to forget the importance of maintaining the tradition of Saharawi poetry and music. However, by collaborating with Saharawi and international musicians, Brahim has given the Saharawi a name, identity and reputation within the refugee camps and in Spain where most of the Saharawi who emigrated to find a better life currently live. Additionally, she has been influential in Western Sahara, where half of the Saharawi population continues to live under Moroccan occupation, and also abroad, where people from all walks of life are introduced to her passionate voice and diva style of desert blues. They don't appreciate we discovered them!